Excerpts from an address given Sep 1998 at Magrath Lions Club 60th Anniversary Banquet by Lion Ken Balderson (then a current member of Magrath Lions Club and son of Gladstone Balderson, our first club president). "When I told my wife Marjorie that I was supposed to speak at our Lions 60th Anniversary there was a long period of silence and then she said, "Well, I will tell you two things: 1) Slow down, just like you are supposed to do on your back swing at the golf course, and 2) Just don't take too long on the tee." "I am honored to have been asked to give a brief history of the Magrath Lions Club. Just imagine, 60 years! That is a long time. How many of you are under sixty years of age? .. (most raised hands) .. 1938 was the year our club came into being - 2 years before the start of WWII. We were sponsored by the Taber Lions Club, who had formed a club 4 years earlier. 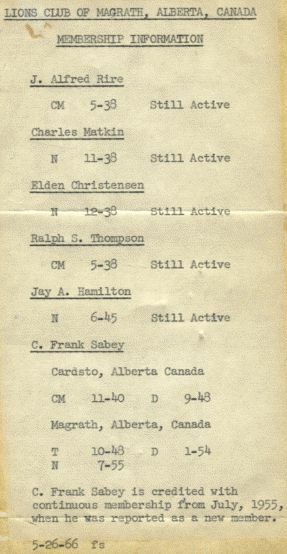 We in turn sponsored the Cardston Lions Club in 1940. Balderson, Gladstone came to Magrath in 1909 with his parents from Iowa and farmed north of town. His wife, Lola, arrived from Iowa in 1911. They built a nice home and farmed until their retirement in 1948. During the course of operations from 1909 to 1948, two threshing outfits and several combines were worn out. The Balderson Brothers threshing outfit was a very popular place to work in the old days. In 1948, their only son, Kenneth, returned from Trinidad to take over the farm. Gladstone was first president of the Magrath Lions Club. Under his direction the Magrath Swimming Pool was built in 1940-41 He was chairman of its construction and organized the Lions carnivals for a number of years which helped finance the pool. Gladstone and Lola were very active in the United Church where he served as Sunday School Superintendent, Chairman of the Board and Stewards and Church Session for many years. The new church was built un 1946-47 under his direction. During the war years, Gladstone was president of the Red Cross and chairman of the Victory Loan Drives and was awarded a Citation by the National War Finance Committee and a personal letter from then Finance Minister IIslay. Son: Kenneth married Marjorie Ririe. "My father, Gladstone Balderson was instrumental in starting our club and was elected the first club president. He as a great organizer. He brought in farmers and ranchers from the north, west, south, and east of Magrath as well as most of the doctors, bankers, teachers and others within the town. We lived on a farm about 6 miles north of the town but spent a lot of time in town doing community work over the years. In those days, there was no television and no paved roads to Lethbridge (22 miles north). No government handouts. Much lower taxes. The Town of Magrath had 3 or 4 Farm Machine Dealerships, 3 Garages, 3 good local Restaurants, a Pool Hall, a Movie Theatre, a Dance Hall, and much more. Our entertainment was mostly self-provided. "So, the Lions Club came to town. 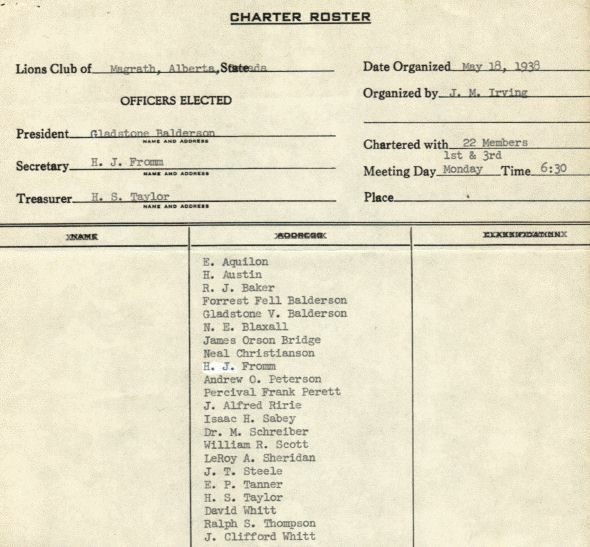 They started with 15 charter members, but soon grew to 35 active members. As a club, they went to work and started to do many things for Magrath. Their motto was, 'We Will Serve'. One of the first projects they selected was to build a community swimming pool. It was to be a large pool and ended up being one of the finest in Southern Alberta at that time. Many volunteers, besides the Lions Club members, were enlisted to help. Day after day, week after week, the hole was excavated using trucks, tractors, and scrapers. They poured cement right around the clock using several small hand cement mixers, wagons and shovels. They were working, donating their time, and having fun. The pool was finished in 1942, complete with diving boards, fences, and life guards. The Lions Club then helped the town finance the pool operation for several years. Eventually the town took over the pool operation. "How did they finance to build the pool? As far as I know, they raised their own money by donations mostly by putting on Carnivals (games and rides) often followed by a town dance. They also ran a competition for Carnival Queen each year, selling tickets (votes) on the girls. The girl with the most tickets sold was named Carnival Queen. They placed a crown on her head and awarded her a prize of a new coat or dress and then paraded her around town and to preside over the town dance. It was considered quite an honor. Matkin, Charles Samuel (Charlie) born 1897 in Cardston, son of Benjamin and Ellen Matkin who moved to Magrath in 1899. Married Ireta Peterson in 1919. Distinguished career in Scouting extending over 40 years, Member of Lions for 36 years - serving as Club President, Zone Chairman, Deputy District Governor, and District Governor. Also served Red Cross 34 years, Chamber of Commerce 30 years, Civil Defense, 24 years. Managed the "Magrath Rockets" basketball team when they won the Western Canadian Championship. Ireta has been equally busy with music, drama, and teaching in the Church (LDS), serving the community in many capacities. She was a charter member of the Magrath Women's Hospital Auxiliary. Children: Kathleen married Harold Anderson; Gordon married Myrtle Bonnett; LeVaun married John Thompson; Nola married Paul Madge; Lucille married Jim Blaxall; James married June Freel. Balderson, Kenneth Kincade beloved husband of the late Marjorie Ririe Balderson, passed away on Monday, May 2, 2011 at the Raymond Hospital at the age of 93 following a brief illness. Ken was born on the family farm north of Magrath on August 9, 1917 to Gladstone and Lola Balderson. He attended elementary school at the Farmhill School and completed high school in Magrath. After high school, he attended the University of Alberta in Edmonton graduating in 1939 with a Bachelor’s Degree in Electrical Engineering. Upon graduation, he worked for the British American Oil Company in Trinidad, British West Indies for 7 years. He returned to Magrath and took over the family farm in 1947. Ken married Marjorie Ririe, daughter of Alfred and Maud Ririe of Magrath, on July 1, 1943. Marjorie passed away September 12, 2008 at age 88. Ken was a hard worker, an honorable man and rendered considerable service in the community. He served on the Magrath town council for 9 years and was mayor of Magrath twice. He also served as President of the Magrath Lions Club several terms and was an active Lion Club member for 60 years. In their later years, Ken and Marge enjoyed golfing and travelled extensively to many countries. They also faithfully followed their children and grandchildren’s sporting events. Marge, although not a lion herself on paper, supported her husband through 60 years of Lionism and is the daughter of one of our club charter members (Lion J Alfred Ririe). She was often found serving at the Magrath Lions Club meetings in the 'Lions Club Building' located next to the Magrath Pharmacy, a building donated for our use for many years and then owned by the Magrath Trading Company, also a legacy of her father.